Two Too Tall Guys – ULAWUN & BAMUS, P.N.G. 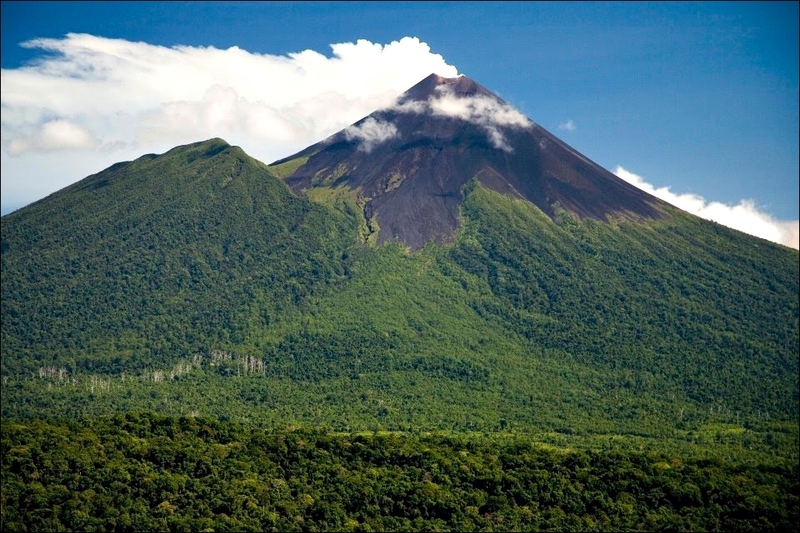 Ulawun stratovolcano is a very steep and 2334 m-high mountain on the central-north coast of New Britain, P.N.G. Bamus stands 2248 m tall beside him, and both have a problem – they’re growing too high. Both Ulawun and Bamus are more than 400 m taller than all other stratovolcanoes in the 1000-km-long Bismarck Volcanic Arc. Given existing faults and scarps of historical events, concerns are that flank failure is in the cards for both volcanoes. Locally the three volcanoes Ulawun, Bamus (to the SW of U.) and Likuruanga (to the NE of U.) are better known as the “Father group”: After myths told by the Nakanai people these three are named Father, South Son and North Son. 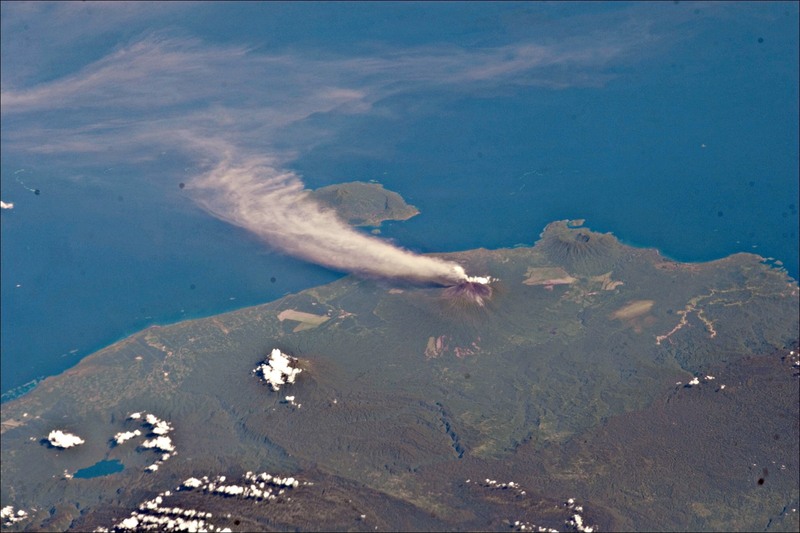 Eruption captured by a NASA satellite on 30 November 2012. The view is from the S; Ulawun with the plume in the middle, Bamus to the left and the conspicuous edifice of Likuruanga at the shore to the right. 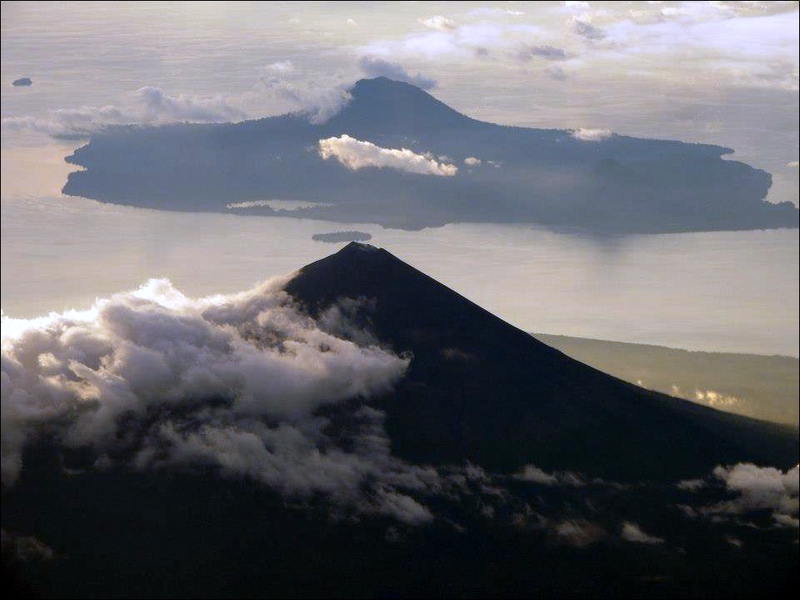 To the north lies the island of Lolobau in the Bismarck Sea, another active volcano. The summit of Bamus volcano is obscured by non-volcanic white clouds. Simple map of a very complex tectonic setting. The two Quaternary volcanoes are found in the eastern part of the Bismarck volcanic arc. They have formed in response to northward subduction of the small Solomon plate beneath the Bismarck plate at a rate of 9–12 cm/yr. The main body of the island is composed of Eocene and late Oligocene volcanic rocks, intruded by dioritic plutons, and overlain in part by extensive Miocene limestone and late Tertiary volcanics. Thus much of the igneous activity recorded on New Britain may pre-date the current northward subduction of the Solomon plate. Instead it could be related to an older (now inactive) subduction system along the so-called Vitiaz–West Melanesian trench, a now inactive subduction boundary with the Pacific plate (to the NE). 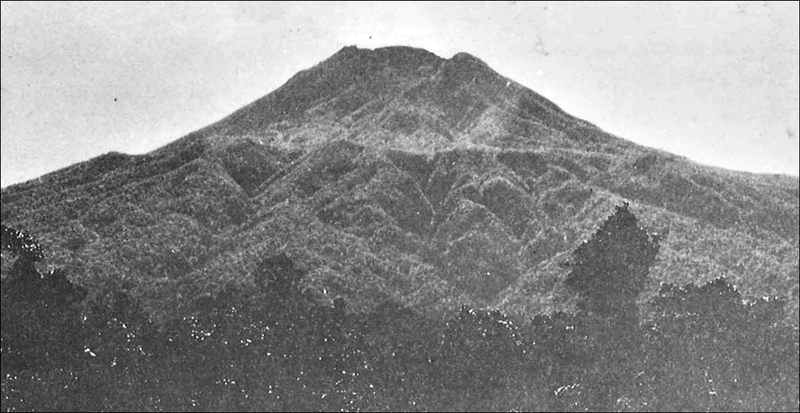 The volcanoes Ulawun, on the left, and Bamus, on the right, were sketched by Powell from Lolobau Island in 1878. 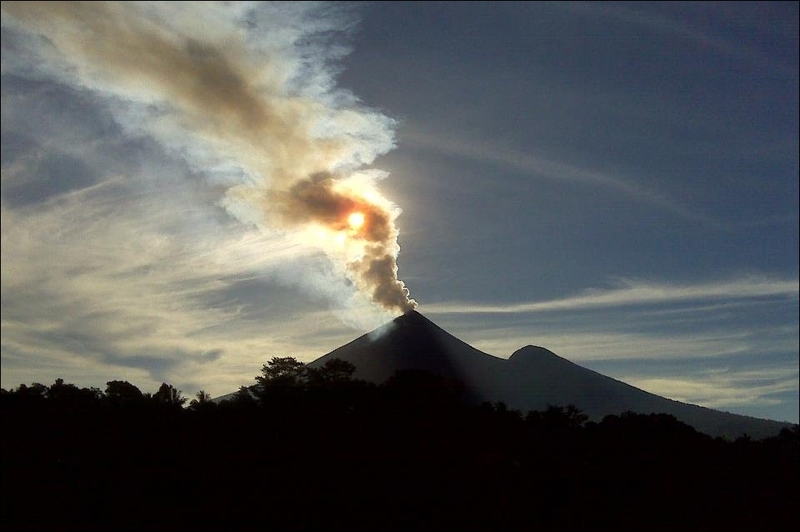 Both are shown emitting vapour plumes, which, in the case of Ulawun at least, appears to contain some volcanic ash. The summit areas of both volcanoes were reported to be free of vegetation, an indication of recent eruptive activity, whereas Bamus today is covered by vegetation. The prominent peak on the extreme left is Likuruanga volcano. On the western and eastern flanks there are several satellite cones and craters. South of Ulamona Mission, three prominent satellite cones form a chain more or less radially to the volcano, which marks a flank fissure. An aerial inspection on 9 May 1978 revealed a small second vent on the SE side of the summit. A spectacular but so far [1970 -Gr.] unidentified phenomenon was observed by pilots of two aeroplanes at about 1045 on 9 May, although nothing unusual was noted at that time from the observation post. This had some of the characteristics of both nuées ardentes and lava flows, to judge by the descriptions, and the mountain was [reported] to have split from top to bottom. Main morphological features of Bamus volcano, showing north- and east-trending lineaments as thick solid lines (broken where features are largely buried). Generalised lava-flow directions represented by arrows, illustrating how the youngest flows of Bamus appear to have been controlled by formerly high escarpments. 200m in contour intervals. (from: R.W. Johnson, 1971) Click! 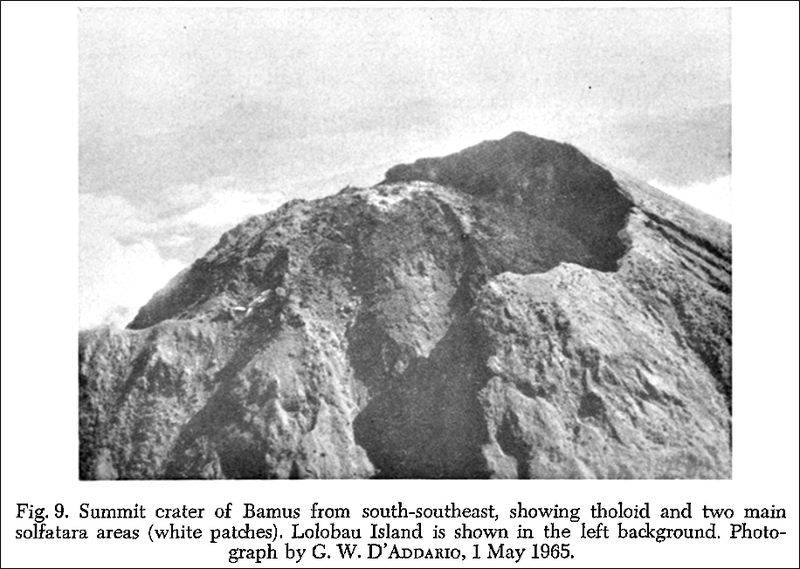 The structure of Bamus closely resembles that of Ulawun: early eruptions have constructed a symmetrical stratovolcano. Later, a collapse of the summit region caused the N-S lineament; probably along a fault. Subsequent eruption from a central vent continued to build up the cone again to its present hight. Bamus contains a breached summit crater that has been filled with a tholoid (lava dome). A satellitic cone is located on the southern flank, and a prominent 1.5-km-wide crater with two small adjacent cones is situated halfway up the SE flank. Across the western flank of Bamus a well-defined lineament, about 7 km long, is clearly visible. Young pyroclastic-flow deposits are found on the volcano’s flanks. Bamus is almost entirely covered in forest, except for its lava dome. Incandescent lava flow from an east-flank fissure of Ulawun. Explosive activity took place from the summit crater of Ulawun May 7-13, accompanied by pyroclastic flows from a fissure high on the SE flank on May 9. The lava flow seen here was emitted from fissures on the lower east flank about 5 km from the summit on May 10-14. At least a dozen vents were active during one of the first observed flank eruptions in Papua New Guinea. The lava flow traveled 6 km to the Pandi River. (© K. Spellmeyer, 1978, via GVP). Since Captain Dampier’s first sighting in 1700 some 40 eruptions have been documented from Ulawun. The volcano produced anything between VEI 1 and VEI 3 on a regular schedule. The only VEI 4 eruption occurred in 2000. The heavy ash fall from that eruption prompted government officials to evacuate 3,750 residents of areas near the volcano. Eruptions since the 1970s have become more frequent and were of greater intensity than in the preceding 100 years. The four eruptive periods 1970-80 were notable for the spectacular expulsion of block-and-ash pyroclastic flows and lava flows. It was the first time that these phenomena had been identified and recorded at this volcano. Ulawun up to 1970 had not been the focus of much volcanological interest at all because most of its few reported eruptions had been weak and less frequent. 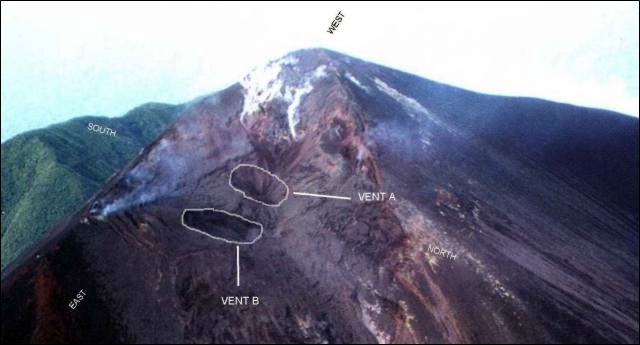 In 1978, Ulawun had an eruption from a new vent in the SE flank of the volcano. The following two decades eruptions came every few years, but after 2000 one every year in average. 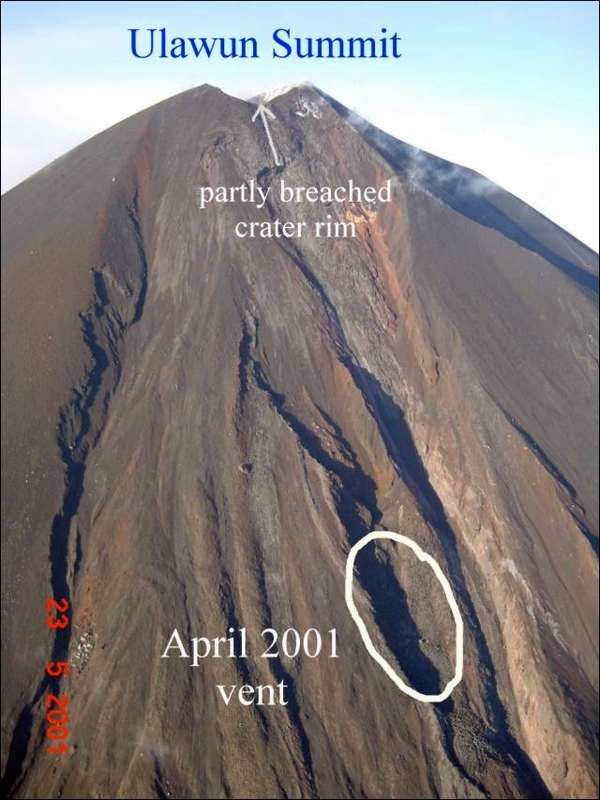 In the 2001 eruption, a lava lobe protruded from another new flank vent and extended about 20 m downslope. It was later confirmed that a dike had reached the surface, resulting in a fissure vent. 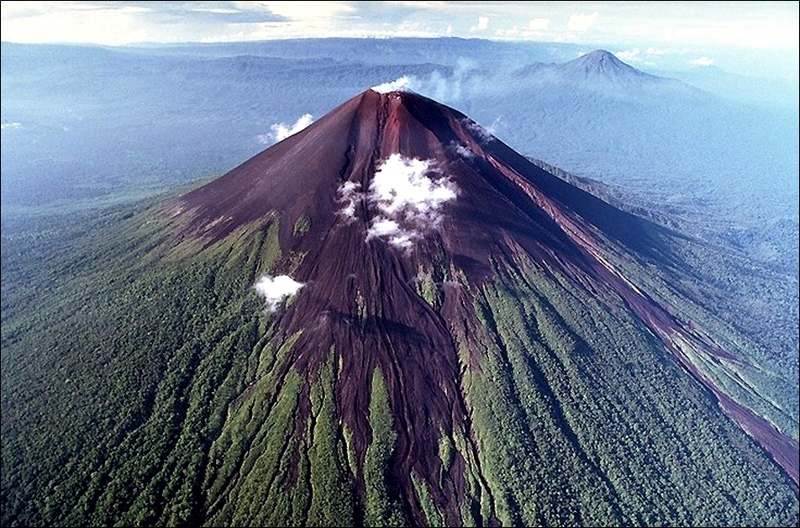 The more frequent eruptions since the 1970 greatly modified the crater of Ulawun. More energetic eruptions usually start with spectacular strombolian fireworks, accompanied by pyroclastics flows, and progresses to lava effusion. Lighter eruptions often consist only of ash plumes, rumbling sounds and/or crater glow The last one recorded by GVP was in June of this year. There are no reliable historical records of Bamus’ eruptions. Yet the locals have stories from eyewitnesses which describe an event at the end of the 19th century. In the 19th century European explorers depict Bamus as devoid of vegetation at the top. Modern observations confirm young material, active fumaroles and sulfur deposits on the lava dome. From February to May 1990 a fluctuating earthquake swarm of several thousand events, incl. a good few M5-M6 quakes, was something of an enigma to the volcanologists: “The cause of this seismicity remains uncertain. Its ongoing fluctuating character, and the fact that its swarms include but do not occur in response to larger earthquakes, could be consistent with magmatic injection. On the other hand, ML 5-6 earthquakes are uncommon for magmatic events. Analysis of the magnitude/frequency distribution of the earthquakes shows that they were indicative of tectonic earthquake sequences. The seismicity was continuing in early April and was being monitored primarily by the permanent seismograph at Ulawun.” On 12 July 2006 white vapor emissions from Bamus were reported from several witnesses. The emissions lasted for two hours; they were forceful and slightly gray in color towards the end. TOO TALL FOR THEIR OWN GOOD? 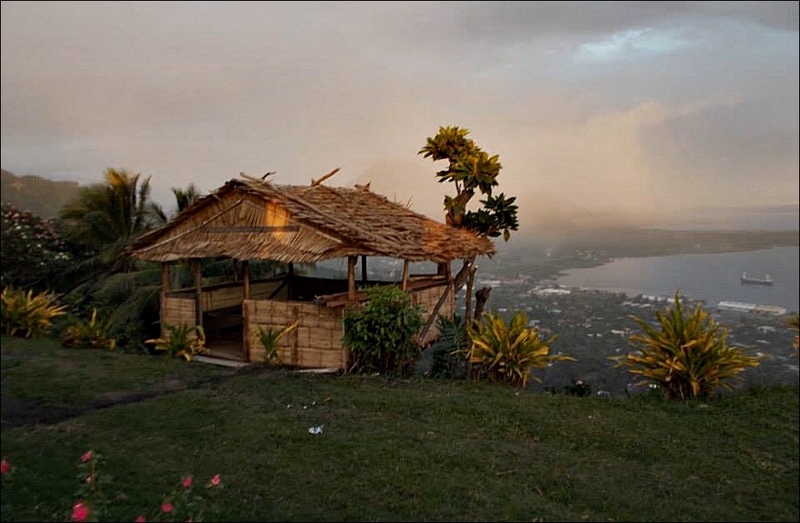 Ulawun has been chosen one of the Decade Volcanoes, not only for its frequent eruptions but also due to its potential to collapse and produce debris slides that could cause tsunami waves. Also, high-rising ash clouds from Ulawun are a threat to aviation; four VAAC, namely Tokyo, Washington, Darwin, and Wellington have an interest in this volcano, because ash clouds may enter their areas of responsibility. Large-scale slumping may be more important than caldera formation in producing any future morphological changes to Bamus and Ulawun. 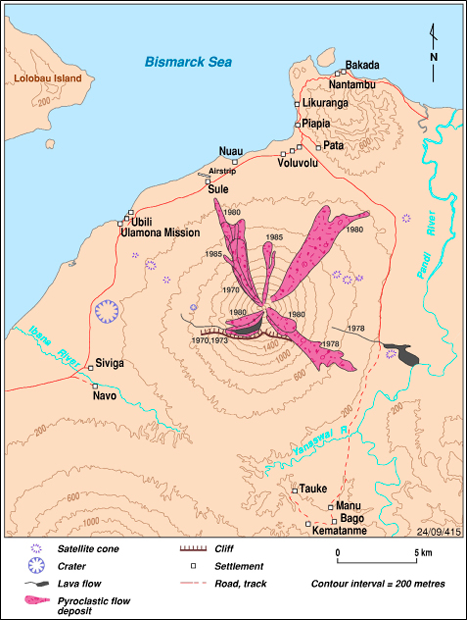 The two escarpments on Bamus and the east-west escarpment on Ulawun may have formed when much of each volcano collapsed along slip planes that flatten off in the deeper parts of the volcanoes. Both cones may have become structurally unstable through continued build-up of volcanic material and steepening of constructional slopes, and may have already failed along planes whose upper parts now crop out as prominent lineaments. NASA Sentinel 2 image of Ulawun from 10 June 2017, showing a red flow or glow on the SE flank. It was also visible on 9 Sept. this year. The structurally unstable condition of Ulawun began to be suspected during the 1970s. 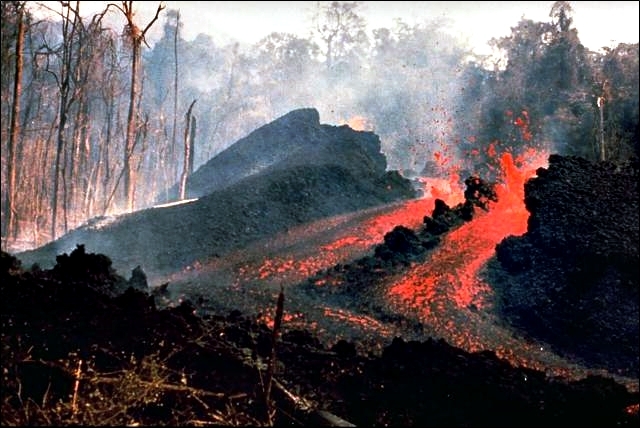 An ‘apparent splitting’ of the volcano was observed high on the steep SE side of the cone on 7 May 1978, and lava flowing from the top of the fissure and, reportedly, disappearing back into the volcano near the bottom of it. An even more unusual but significant phenomenon took place on 10 and 11 May when lava began flowing from a large number of vents on a linear fissure low down on the eastern flank of the volcano. This represents the first time that such a ‘flank’ eruption had been observed and recorded at any active volcano in Near Oceania. The flank fissure trended towards the summit of Ulawun, implying that the volcano is capable of producing magma along radial fractures deep within the volcano. A line of four old satellite cones that runs south-eastwards from near Ulamona on the western flank of Ulawun is evidence for another radial fracture, and there seems to be another radial alignment of small cones on the north-eastern flank too. Ulawun is not plugged in the same way as Bamus, but it probably represents the greater hazard of the two as far as major collapses are concerned. 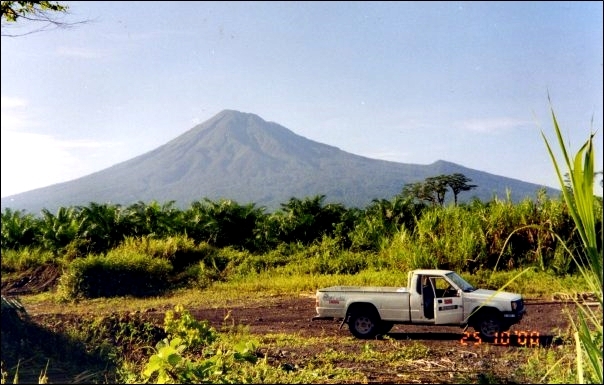 The numerous eruptions of Ulawun this century, and particularly since 1969, have continued to build up this volcano to progressively greater heights, and the slopes of Ulawun are the steepest of any composite volcano in the Bismarck volcanic arc. Because Ulawun has undergone three strong, pyroclastic-avalanche-producing eruptions in the 1970s – the one in 1978 rupturing the cone in two places on its flanks – McKee et al. (1981) suggested that the volcano may have been sufficiently weakened that future eruptions may exploit radial fractures in the cone. 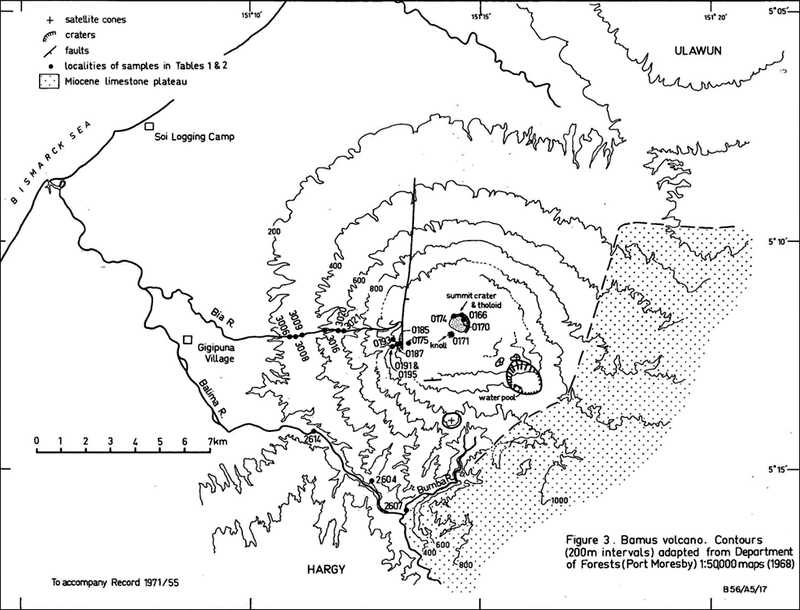 An alternative view is that the 1978 eruption from a fissure on the eastern flank of Ulawun is an indication of both tectonic stress and unstable loading in the volcano, and that stress could be relieved by large-scale collapse of the Ulawun volcanic pile. The danger at Ulawun, therefore, is that gravitational failure of the apparently over-steepened and over-heightened cone might take place, especially at times when magma injected into radial and other deep-seated fractures causes the volcano to swell and then fail. The danger is not just to the nearby coastal communities but also to coastal settlements elsewhere in the Bismarck Sea, if a large debris avalanche caused a Ritter-like tsunami. ARE FATHER AND SON RELATED? Of course, all the similarities between the two volcanoes begged this question. The summits of Ulawun and Bamus are 20 km apart but sit on the same line at similar heights above the New Britain Benioff Zone (where magma is generated after subduction). Both are of similar shape and hight, both have been active in recorded history. This made R.W. Johnson et al. wonder, in a 1983 paper, whether these two volcanoes might be related in their eruptive history, or have perhaps a common magma reservoir? However, they found that the rock compositions show major differences. Ulawun consists uniformly of tholeiitic basalts, while it’s neighbour produced differentiated lavas with time: basalts in its early stages, but thereafter andesites. According to the different lavas, Ulawun is an open-sytem volcano, frequently erupting liquid lavas. Bamus, to the contrary, had its last eruption in ~1890 and has since extruded a viscous lava dome plug. The authors concluded that Ulawun’s and Bamus’ magmas have evolved independently of each other throughout the build-up of the volcanoes. Seen in context with other high-risk volcanoes one may wonder how Ulawun became elected for the Decade Project. Nevertheless, it has been chosen, and one may now expect that some scientific work would have ensued to reduce that confirmed risk. In the 1970s and 80s, Richard Wally Johnson and colleagues have done extensive work on the two volcanoes, some of which is almost half a century old by now. In some papers Ulawun is mentioned as an aside in research related to arc magmatism; some more recent studies explore how to measure sulfur emissions from Ulawun remotely from satellites. But nowhere have I found any mention of work done on the edifice of Ulawun (or Bamus). Certainly, research on flank failures in volcanoes would be of interest for other areas too? *If you ever want to get a visual idea about modern P.N.G. go and visit Peter John Tate’s account on Panoramio (as long as it’s still there). He has done a tremendous job publishing some 30k or more photos of his own as well as some other collections. I do not know the circumstances, but I am always locked at least for an hour once I start paging through this wonderful collection. Nice write-up Graniya. I know how difficult it is to find material on this part of the world despite it being so active. Makes it even more frustrating when you realise how dramatic the volcanos on New Britain are! Maybe some budding volcanologist gets your hint and does a research paper on it. Uluwan sounds likes it primed for a sector collapse. Alert lvl. for Agung volcano (Bali) has been raised today (14/9) to “2” (of 4) b/o increase in volcanic seismicity. 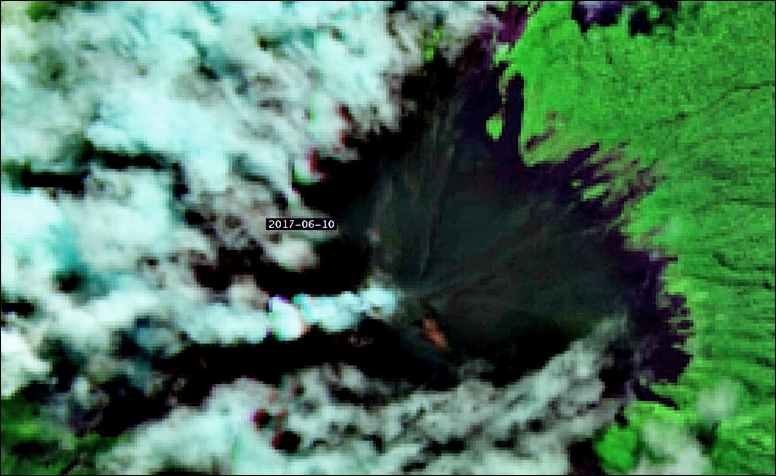 This is link I just stumbled upon about Bogosloff – images of the May 28 eruption from space. Status for Mount Agung has today been raised to “Siaga” (3 of 4). Official local reports (via newspaper) are of a small white plume and, after an eq M 3.1 in the mountain, “flames” have been seen. Also at least one person said he has seen ash. Take that with a grain of salt, though. However, there are quite large thermal anomalies visible on satellite imagery at the NE lower slope of the mountain (check MIROVA under Batur volcano and Terra/Aqua Modis). I won’t post them just yet, as they could be wildfires or something. 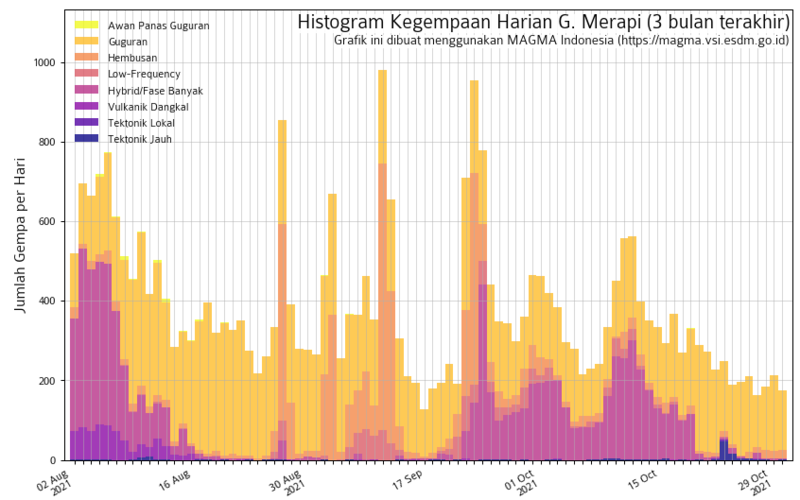 I dearly hope G. Agung will behave himself, his last eruption (1963) was devasting with over 1000 fatalities. As I thought, they were forest fires.